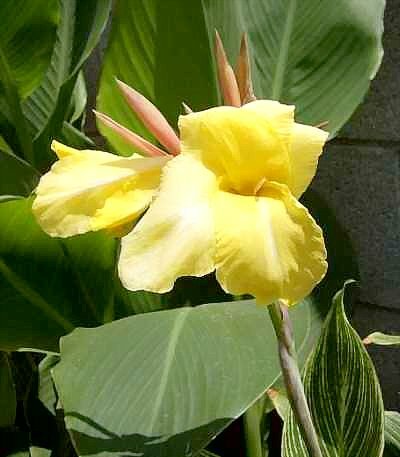 Canna ‘Bangkok’ has the brightest yellow buds. 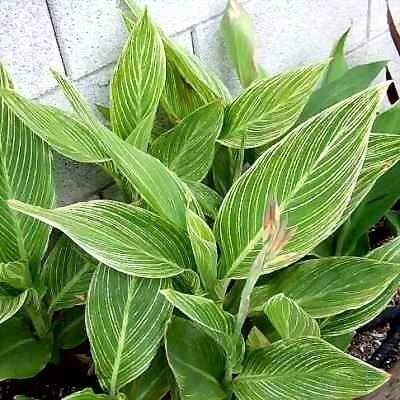 C. ‘Bangkok’ is a treat for the eyes: green and white striped foliage, sunny yellow flowers, and red buds. It is short, so this year I am growing it in a pot. The foliage alone is very decorative. Bangkok’s flowers have a white stripe down the center of the petal. 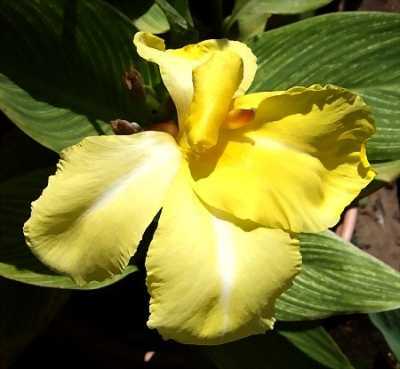 Canna ‘Bangkok’ has yellow flowers with a white stripe down the center of the petals. Bangkok’s flowers are very beautiful and delicate. Unfortunately they do not hold up well under the desert sun. I felt fortunate to catch this lovely flower in a pretty good light. The foliage is a different story: it always looks great! I can understand now why some gardeners cut off the flowers and just grow Bangkok for the vigorous and dramatic foliage. Not that I would do that, mind you! Bangkok has numerous synonyms – different names for the same plant. They include ‘Striped Beauty’, Christ’s Light’, ‘Nirvana’, ‘Minerva’ amd ‘King of Siam’. 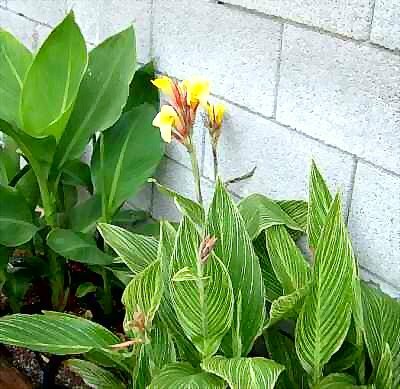 I am certain now that my mystery canna is Bangkok. And look in the background at the enormous leaves of C. ‘Red Dazzler’. 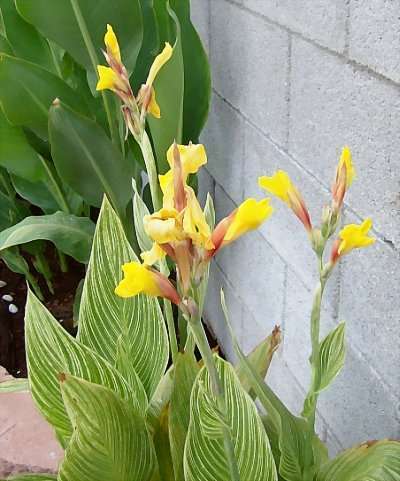 This striped leaf canna is new to my yard. It seems very happy in Las Vegas. It’s growth could be described as aggressive. I’m really excited about seeing the flowers. The leaves make me think of C. ‘Bangkok’, but we shall see.